Olympian Donald Macgregor has written about the first two People’s Health Dundee Marathons (both of which he won) in his fascinating autobiography “Running My Life”. Aberdeen and Glasgow had led the way, while the Edinburgh People’s event had not been a success. However Dundee – the ‘City of Discovery’ – was determined to create a well-organised, popular event. It was sponsored by Radio Tay, The Courier, the Health Organisation Council and the City of Dundee. Since the first Dundee Marathon, “Don Macgregor’s Marathon Manual” had been published by the Scottish Health Education Group and Radio Tay. This was full of excellent advice. In addition, to encourage would-be marathoners, Don had delivered no fewer than 26 four-minute weekly slots on Radio Tay on Saturday mornings. The Scottish Marathon Championship was included in this event, so Terry, Charlie and Sam were the SAAA gold, silver and bronze medallists. “The only problem was in the last six miles when I began to feel the pace a bit, but I got to the end okay,” said the victor. 1ST Woman: Jill Danskin (London Olympiades) 3.00.39. Jill Danskin, a team-mate and training partner of the illustrious Leslie Watson, became the most successful female competitor in the Dundee Marathon, with a third place in 1985 and three wins in succession from 1987-89. 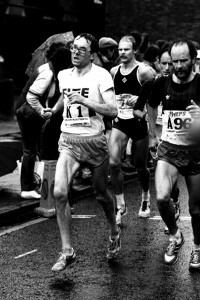 Paul Briscoe ran for Dundee Hawkhill Harriers in the Edinburgh to Glasgow Relay; and won a team silver medal in the Scottish National Cross-Country Relay in 1990; plus a team bronze medal in the National CC in 1993. 10 D. McNicol (Fife AC) 2.38.56. Stuart Asher, a good hill runner, is a quiet man with considerable athletic talent. He was understandably pleased to win his local marathon after a fine battle with the consistent Bob Wood and previous winner Paul Briscoe. Eileen Masson also won the Scottish Women’s Marathon title twice: in 1988 (Aberdeen Marathon); and in 1991 (Inverclyde Marathon at Greenock). Before he switched to Fife AC, in 1985 Hugh Mackay set club records for Dundee Hawkhill Harriers: 800m in 1.52.20 and 1500m in 3.48.3; so his ability to produce a sprint finish to win a competitive marathon was not surprising but his stamina certainly was! Don Ritchie wrote in his training diary: “I ran in the ninth and final edition of the City of Dundee Marathon. My start was fine and I tucked in with the leading bunch, but I drifted off the back as I began to find the pace too hard to maintain. I was pleasantly surprised to regain contact with the group by the time we got to Riverside Drive. I got my first drink at nine miles, but had to stop to retrieve it from the table. This, plus trying to drink it caused me to lose contact with the group, but not with John Duffy of Shettleston. We ran past ten miles in 55.24 and the halfway point in 1.13.06, which was pleasing. Now, however, we were exposed to winds and our pace slowed. Thus ended the City of Dundee Marathon, for nine years a successful race on a fast course. The event’s rise and fall coincided almost exactly with the boom years of Scottish, and indeed British, marathon running. Maybe the fashion will return in the 2020s?